Please consider JOINING our team and HELPING us REACH the Syrian Refugees in Kurdistan. The biggest way we could use your help now is with FINANCIAL support from our friends and family. The U.N. has stated the Syrian war has created the greatest refugee crisis since Rwanda. Over 120,000 civilians have been killed since the beginning of the conflict, and nearly 2.2 million refugees have been forced to flee to Jordan, Lebanon, Turkey, Egypt, and Kurdistan (Northern Iraq.) Nearly 1 million of these refugees are under age 11, and there are another 4 million civilians internally displaced. World Compassion has been serving a Syrian refugee camp in Koya, Iraq (Kurdistan) for over 1 year. They provide monthly food distributions for over 3,500 Syrian refugees and are working with the local church. We are honored with this exciting and historic opportunity that our friends from World Compassion have invited us to partner with them on. Our team from More Than A Game will start a soccer program in the Syrian refugee camp in Koya, Iraq to help restore a sense of normality into the lives of the displaced refugee children and partner with World Compassion and the local church to bring hope through soccer camps, a tournament, and a soccer league that we hope will continue on after we leave. Help 9 of our team members reach their goal of $31,500 to impact a Refugee Camp. $3,500 per team member to coach Syrian refugees, train coaches, and bring hope and relief. Help us reach 325 male youth in the camp through soccer. 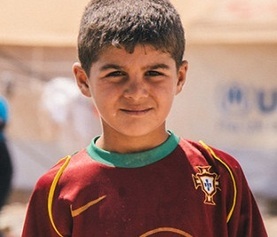 $100 per Syrian refugee youth to allow them to play soccer again and be impacted forever. Thank you for partnering with us in this amazing opportunity to reach out to the Syrian Refugees! Your prayers and financial support will allow us to help those in need.